During the early days of my tenure at a behemoth New York City law ﬁrm, the seed for The Chrysalis was planted. After a particularly grueling workweek, my close friend and then fellow associate Illana asked me a question, one posed to her in a law school seminar. Would I ever decline to represent a client on moral grounds, even though the client had a solid legal basis for the position it wanted to advocate? Over the weeks that followed, her query stayed with me. As I reviewed box after box of discovery documents, I kept asking myself whether such a client really existed for me. After all, like most lawyers, I had the occasional client with a position resting on strong legal principles, though its stance might be tinged around the edges with moral ambiguity. Then an article describing the emergence of a few cases in which families of Holocaust victims attempted to recover artwork stolen by the Nazis during World War II captured my attention. I began to do some reading and research in my not-so-copious spare time. Sympathy for the seemingly wronged plaintiffs did not translate into superior legal rights; the law did not seem to favor the surviving family members of Holocaust victims. In fact, the opposite was more likely to be true. I had my answer to Illana’s question: If I was asked to represent a client in its efforts to keep artwork from a Holocaust victim’s heirs, I hoped I would decline, even if precedent supported the client’s arguments. 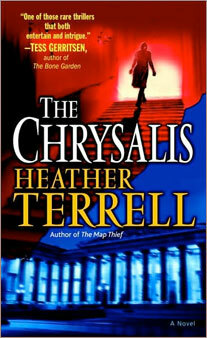 This process yielded the backdrop for The Chrysalis, even though its main character, Mara Coyne, does not refuse to represent Beazley’s. The legal landscape depicted in the book is largely accurate. Holocaust survivors and their families ﬁling civil suits as private plaintiffs must deal with many of the same issues faced by Hilda Baum. I did streamline the issues, ﬁctionalize the legal precedent, and heighten the difference between the relevant American and European law, both for dramatic tension and to make a murky quagmire of arcane procedural issues more interesting and accessible. Since I began writing The Chrysalis, the topic of who owns artwork plundered during wartime has become headline news. Some courts and legislatures have made efforts to rectify the inequities in the law, injustices that did not anticipate the horror of the Holocaust. Conferences have been conducted; guiding principles established; commissions on looted assets formed; art-loss registers created; legislation considered and, in some situations, adopted. Plaintiffs have ﬁled more and more cases, and some courts have begun to shift the case law. Given that private plaintiffs seeking the restitution of art looted by the Nazis must still leap over many of the same hurdles as Hilda Baum, however, I left those developments unmentioned and unexplored. They will make a brief appearance in my next book. The idea for introducing a ﬁctional seventeenth-century Dutch artist and painting into this realistic legal setting came mainly from my reverence for the artwork of that time period: the quality of the light, the near-photographic attention to detail, and, most of all, the multifaceted symbolism, which acts as a prism that changes the viewer’s initial perception. The full reason is more complicated. Since The Chrysalis’s legal issues focus on who owns artwork throughout time, I thought it might be intriguing to make the custodial fate of the painting dictated by its iconography. I became captivated by the idea that the painting’s religious symbolism would determine its ultimate destiny—namely, to be acquired by Erich Baum for his personal worship, to be discarded by the Nazis due to its Catholic message, to be welcomed by the Jesuits as a returned treasure, and, lastly, to be sought after by Hilda Baum as a remembrance of her late father. The seventeenth-century Dutch paintings—with the hidden stories that lay beneath their deceptively simple scenes—seemed perfect. But no one existing painting told each of the stories I hoped to share. So, I created Johannes Miereveld. And The Chrysalis.